This entry was posted on Sunday, June 21st, 2009 at 9:20 am	and is filed under Gluten-Free Recipes, Seasonal Foods. You can follow any responses to this entry through the RSS 2.0 feed. You can leave a response, or trackback from your own site. I’m writing this reply positively ‘funking out’ to The Whispers’ 1979 classic song about the longevity of beets. Funnily enough, back then my elder sister had a pair of leg-warmers the same color as your ice cream. Your ice cream looks fantastic, it would be such a highlight at a dinner party. I know you say eat to it alone but my friends and I have very childish senses of humour and fuchsia-colored tongues would keep us entertained for hours. The big curve ball for me were the chocolate chips! I didn’t see that one coming. I’ll have to see if my slowly rediscovered sweet tooth could handle that one. Ah, what the heck, I trusted you this far! Oh, a quick tip on cleaning the kitchen… if you cover your eyes with your hands then all of the stains disappear. You’re too young to remember it was Sonny Bono who wrote the lyrics to “The Beat Goes On” and he and Cher who made it “famous.” Oh, but I can only imagine your sister in her fuschia leg warmers groovin’ to the Whispers “Rock Steady.” That’s got a perfect beat for leg warmers. I laughed out loud at your comment about you and your friends’ senses of humor. Nothing like pink teeth to liven up a party. Skip the chocolate chips and use real cream instead. I just figured pink and chocolate go together (it’s a girlie thing). I imagine real cream would make this over-the-top good though. Michael Symon added cayenne pepper to his version. That would add even more zip to your dinner party. 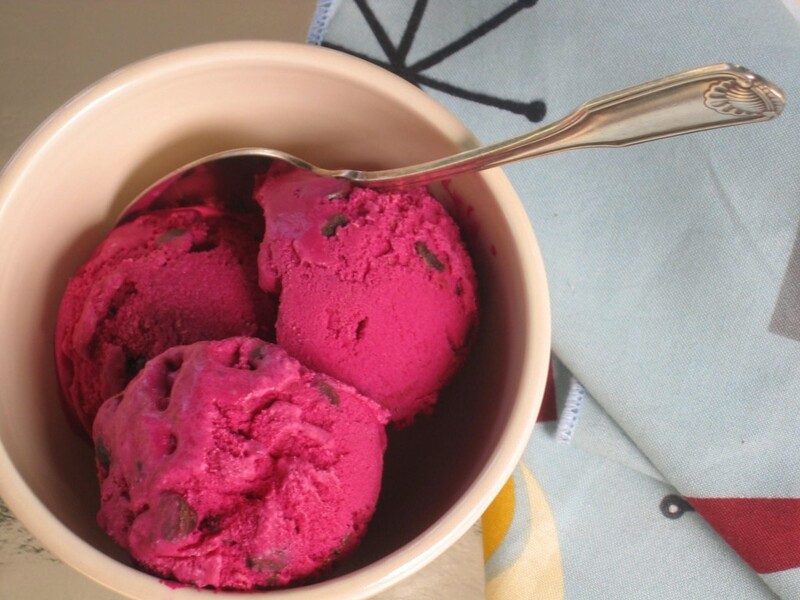 I thought beet ice cream was all my idea. Geez, I guess there never really is an original idea. Thanks for the kitchen tip. What happens when you finally open your eyes again? One more thing — didn’t I hear you say you had a fiancé (imaginary, but who cares) named Fuchsia? This ice cream could be your chance to get her attention. Have her over for dinner and name the dessert in her honor. I’m sure Cid can advise you as to the best way to pull this off. What a fabulous icecream idea…. now you know what my daily juice looks like regardless of what I add, due to the beets. What fabulous ice cream. Gorgeous colour. But now I have *that* song in my head and can’t get it out! Beets in ice cream? Now that I think I can do! LOL It can’t be worse for public viewing than eating blueberry ice cream or God forbid that blue bubble gum (or similar) ice cream that the kids like to eat. Yeah, I have to agree with “another outspoken female” … thanks for implanting that tune in my head. I’m seeing Sonny in his funky glitzy dashiki shirts and Cher in her Bob Mackie dresses, plus remembering their silly dialogues. AOF — sorry about that (the replay of the song in your head). You’re not the first person who has called me out on that. In fact, I have it running through my head each time I revisit this post. Ugh! Yes, I agree with you on the vibrant color of this ice cream. It is gorgeous, but it ends up making everything it touches pink. Careful, careful! I knew I could figure something out to get you to eat beets. All it took was ice cream and chocolate chips. You’re such a girl! Wow, I’m totally impressed that you made the connection between Cher and Bob Mackie dresses. You’re right! Now it’s coming back to me. The wild Academy Award shows, etc. Good one! I had to look up dashiki though. You’re starting to remind me of Cid. Every time she leaves a comment, I have to resort to my dictionary. This is the most beautiful ice cream I ever did see! I agree, it’s an incredible color — until it’s on your shirt or tongue. Melissa–ROFL on being “such a girl!” Hey, after you looked up the dashiki, did you remember Sonny wearing them? I had a roommmate who made matching dashikis for her and her boyfriend at the time. They were made of a satiny material and kind of a tye-dyed orange and white print. LOL Hey, I’ll take that as a compliment, comparing me to Cid–thanks! This looks beautiful! 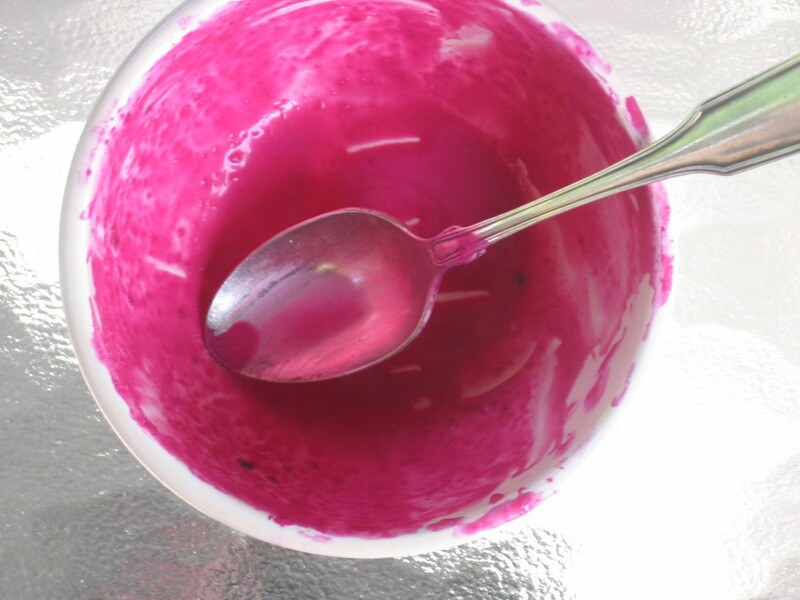 Do you think the change of raw vs. cooked beets would give it more of a “beety” flavor? I just might have to try this (with non-ice cream maker variations). Isn’t it funny how you think you have an original idea/recipe only to find it’s been done before? That always happens to me!! Melissa, do you eat dairy free or just prefer coconut as your ice cream base? (I’m just curious/nosey). Also, what kind of chocolate chips do you use? Catching up on your posts and reading everyones comments cracks me up, it’s just as much fun as reading your entries! Yikes, I’m behind here. How did that happen? Oh my gosh, matching dashikis? Oooh. I do remember Sonny wearing sheepskin vests. I don’t know about raw vs cooked, but I think the cooked might work better. I’m going to give raw a try though. I do MUCH better without dairy, but I can get away with a little bit here and there. I just have to choose wisely. No wasting it on Velveeta cheese! I use those gluten-free/dairy-free Sunspire chocolate chips. Actually, that doesn’t sound right. I don’t have any on hand, I’ll have to look next time I buy them. I agree with you about the comments on this blog. I LOVE you guys! Slushy? Wow, I could hardly scoop mine out of the ice cream maker. Did you freeze the empty ice cream holder before churning the ice cream? You’re supposed to freeze it first. Pistachios? Hmmm, that gives me an idea. Sounds great! SO SO pretty! And already dairy-free so I don’t have to change a thing. Except I don’t have a juicer or vitamix. Wonder how smooth my Oster blender will make this “juice”. Hmm…! Definitely going to try, depending on how many beets I pick up from our CSA today. We made this yesterday with raw beet juice (with Grant Farms CSA beets plus a few from Vitamin Cottage) and it is amazing. Everyone loved it -my picky Dad, our friend who doesn’t like coconut, husband, and Mom, who kept saying “and it is even GOOD for you!” Two thumbs up!